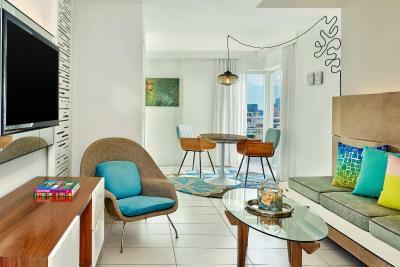 Nice decore when you walk in lots of bright colors. Having stayed before I expected no less of the room....first time I had breakfast and it was excellent....a bit on the crowded side since no doubt the weather was not the best! Nothing, waisted spaces around! Room for disabled I got!! Thank you for wonderful vacation! 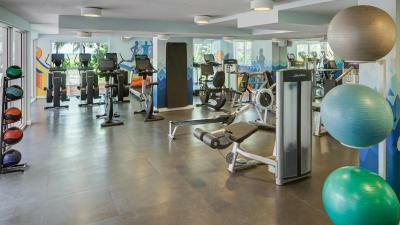 The poor never used, the Gym also, even paid for it! Nothing for people, everything to guarantee to the hotel a revenue!!! Location, the staff in front the gate. the nice smell in all hotel, Nice view from balcony, i recommend the hotel for thos who is looking for beach, view and location. Great location. Nice sea-view room, albeit aging. . It was perfectly located with a stunning view, great pool and very nice and clean beach. 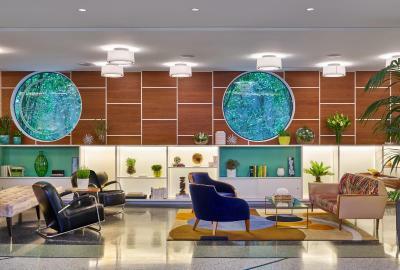 Located on the shores of Miami Beach, the Royal Palm South Beach Miami features an on-site spa and wellness center. 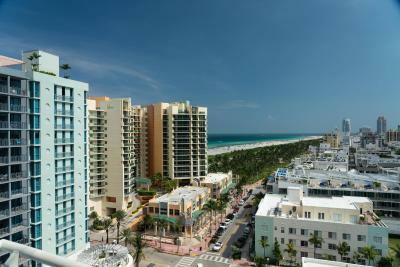 The resort is 5 minutes’ walk from Lincoln Road Mall. 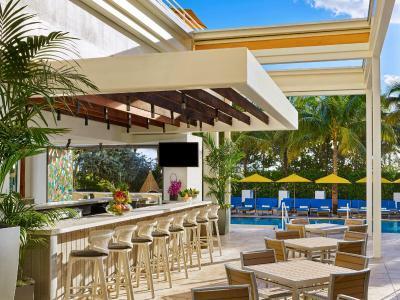 Featured on site, The Compass Rose Bar has a selection of coffee, tea, and evening cocktails while the Florida Cookery serves breakfast outdoors. 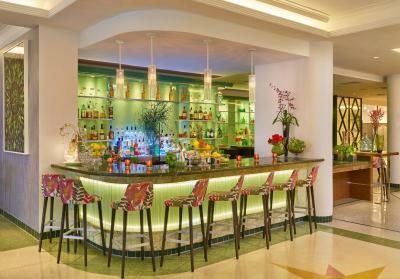 Byblos Miami prepares Eastern Mediterranean with a local flare. 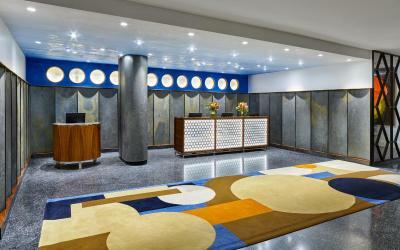 Free WiFi and a 42-inch flat-screen TV are provided in every guestroom and suite. 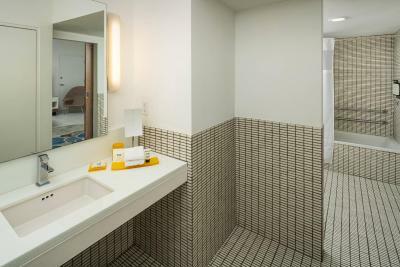 A seating area and private bathroom are also provided. Select rooms and suites feature a balcony. 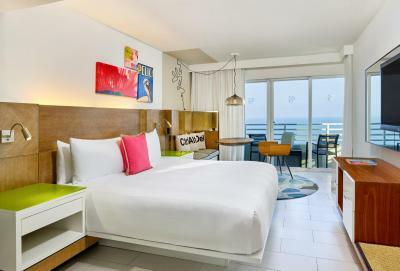 Two outdoor pools, accompanied with music, and direct beachfront access are provided to guests. Cabanas are optioned, and the on-site spa offers massages, skin care services, and privai wellness services. New World Symphony is 9 minutes’ walk from Royal Palm South Beach Miami while Miami Beach Convention Center is 14 minutes’ walk. Miami International Airport is 11.8 miles away. 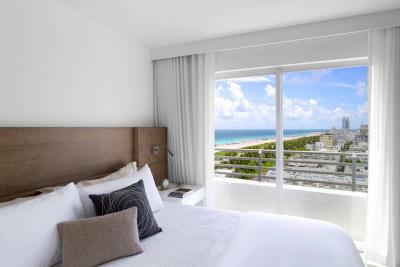 This is our guests' favourite part of Miami Beach, according to independent reviews. Couples particularly like the location — they rated it 9.0 for a two-person trip. 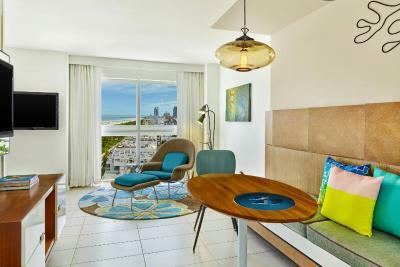 Royal Palm South Beach Miami, a Tribute Portfolio Resort has been welcoming Booking.com guests since 19 Aug 2010. 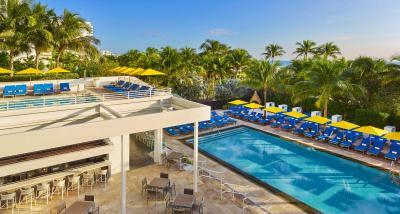 When would you like to stay at Royal Palm South Beach Miami, a Tribute Portfolio Resort? This double room has a tea/coffee maker and air conditioning. Private parking is possible on site (reservation is not needed) and costs USD 43 per day. 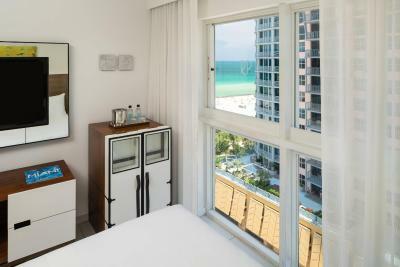 This double room features a tea/coffee maker and air conditioning. This double room has a flat-screen TV, tea/coffee maker and air conditioning. 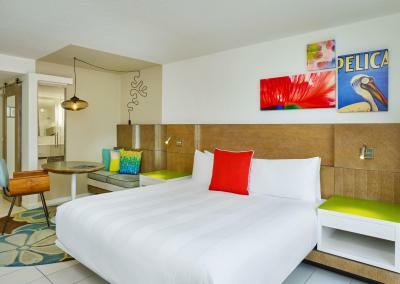 This double room features air conditioning and tea/coffee maker. This double room has a balcony, tea/coffee maker and air conditioning. 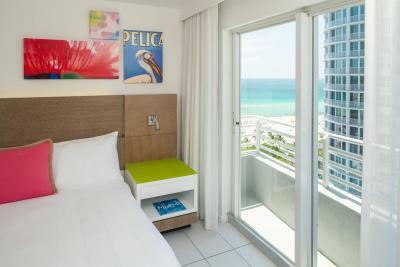 This double room features a balcony, air conditioning and flat-screen TV. 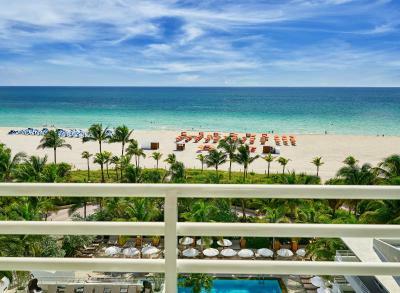 With an ideal South Beach locale, just north of world famous Ocean Drive at 15th Street, Royal Palm South Beach Miami is an oceanfront resort situated within the coveted and culturally rich area of South Beach, Miami. Pets are allowed on request. Charges may be applicable. 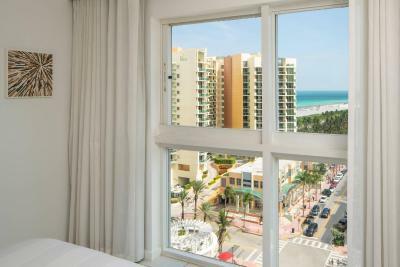 House rules Royal Palm South Beach Miami, a Tribute Portfolio Resort takes special requests - add in the next step! 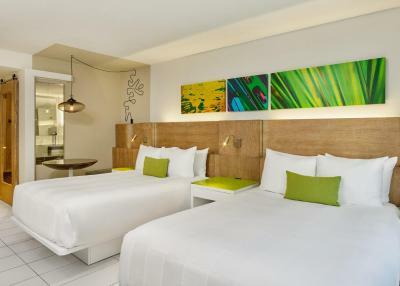 All further older children or adults are charged USD 30 per night for extra beds. 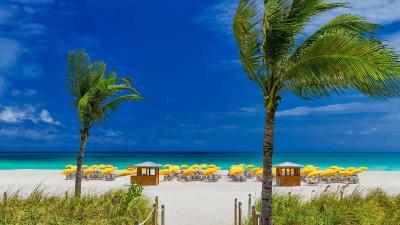 Royal Palm South Beach Miami, a Tribute Portfolio Resort accepts these cards and reserves the right to temporarily hold an amount prior to arrival. Guests under the age of 21 can only check in with a parent or official guardian. Please note that a microwave and refrigerator are available upon request for a surcharge. This is dependent on availability. Please note that for rooms that include breakfast, the Breakfast Included Rate is only for 2 guests. The resort fee is charged per night plus tax. -All credit cards used for payment must have an EMV chip. water bubbler in workout room doesn't work. Elevator #1 smelt like dog pee the whole week. mix up the breakfast a bit not the same stuff every day. Staff is amazing. Rooms are not isolated and you can hear noises from other rooms. Good pool and bar, great location. The Location is great! Also the Beach service was great! but for the price i would have payed extra $150 and went to Loews next door. The hotel did not list the additional prices for the services they offered there, such as parking and breakfast. Also the hotel was hard to find and the space was compact. Some of the staff did not seem friendly, through guest interactions. The breakfast and location of the hotel was the only think that was enjoyable during our stay at this hotel. My only complaint was we order room service for some lemon wedges and that took over an hour to arrive. That is minor in comparison to the wonderful stay we had. I had a wonderful stay! Hotel did not have my reservation when I arrived, they said booking did not provide it. It took over 30 minutes standing in line to figure out how to proceed. Elevator had urine smell which according to hotel personel is coming from the material they used recently to renovate elevators🤔 When I was checking out they tried to charge me over 300 dollars more than booking stated. After complaining they corrected it. Snack bar in lobby ran out of food in the morning so could only have coffee. Staff were apologetic. Staff were always polite and helpful. Management of property. Broken elevators. Ignored complimentary breakfast until we called them on it. Front desk staff snarky attitude. Terrible food in restaurant. My bed could have been a little better with a better frame. We love the way all the workers work together to make our stay a pleasant trip. We looking forward to coming to stay next year God willing.